Haverford has agreed to let the Bryn Mawr College Phebe Anna Thorne School renovate this houseâ€”located across the road from the Koshland Integrated Natural Sciences Centerâ€”and occupy it on a long-term lease. Come September, #6 College Circle will be welcoming the pitter-patter of little feet. Haverford has agreed to let the Bryn Mawr College Phebe Anna Thorne School renovate this houseâ€”located across the road from the Koshland Integrated Natural Sciences Centerâ€”and occupy it on a long-term lease. The Thorne School is a nursery school run in cooperation with Bryn Mawr's Department of Psychology that helps children develop a sense of competence and well-being through group play, problem-solving, and social interaction. The PAT School will use #6 College Circle as a home for its new kindergarten program. 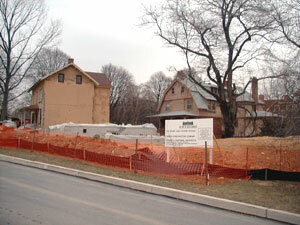 In November 2003, Grieco Construction of Aston, Pa. (hired by Bryn Mawr for the project), began renovating the existing house and constructing a two-story addition to the south side of the building, designed by the Philadelphia architectural firm of Brawer & Hauptman. Each floor will contain a classroom, bathrooms, a small kitchen, and an office. An outdoor play space will be located near the grove of trees down the house's slope, and will contain developmentally appropriate play equipment for the kindergartners. A paved access driveway running from Coursey Road to College Circle will be used by parents to drop off their children. Leslie Rescorla, director of Bryn Mawr's Early Childhood programs and psychological consultant at the PAT School, first noticed the potential of the College Circle house three years ago, when the school had begun planning its expansion to the kindergarten level.“It just looked like a schoolhouse to me,” she says. Learning that there were no immediate plans for the empty house, Rescorla met with President Tom Tritton, then-provost Elaine Hansen (a former PAT parent), and Haverford's College Planning Committee to discuss the possibility of the PAT School renovating and using the building.“Everyone agreed that it would be a nice space for the school,” she says,“and a good way of getting Haverford students more involved.” Many Haverford students from various majors already work alongside their Bryn Mawr counterparts as PAT classroom assistants, and an on-campus locale would encourage more volunteers to get involved. The PAT School plans to use the existing house as classrooms for the two kindergarten programsâ€”one for typically developing students and one for children with language issues who may be at risk for reading and learning difficulties. The first floor of the house will be reserved for the regular kindergarten, while the second and part of the third floors will provide a quieter, more intimate environment for the language program. Construction on #6 College Circle should be completed in late spring, and should be ready for the fall 2004 inauguration of the PAT kindergarten. In the summer, the facility will be available for use by Haverford programs such as Serendipity Day Camp.